Our iconic sequin dress has been rejuvenated! The Criss Cross dress features a round neck, soft V back with long sleeves in a flattering mid thigh length. Wear with sky high metallic wedges for a head-turning evening look, or dress it down with a side pony and simple jewellery. 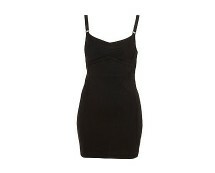 Get that retro look in this black bodycon tunic with cut out back detail. 94% Polyester, 6% Elastane.